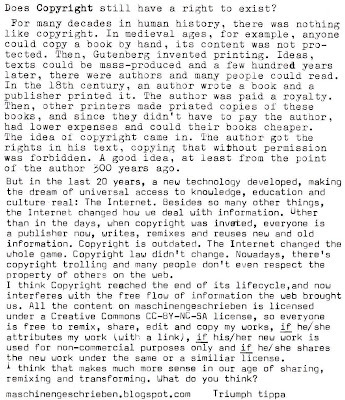 maschinengeschrieben: Does Copyright still have a right to exist? Does Copyright still have a right to exist? Copyright for the most part is all about money. Composers like Bach, Beethoven, Handel and many others of that era all took it as a complement when another composer used some of their work their (another composer) piece. Now composers sue others for use of their works. There is more. I am being a bit sarcastic. Copyright does protect music, the printed work and photos. It still has its use. Many people today still allow others to use their work as long as the originator is noted on the reused. Why I like copyright is that when I did photography the local news paper would always like my photo, usually for a small sum or free, than I'd see it copyrighted by them, the other big news agencies and/or others. Then they wondered why they could no longer use my photos. 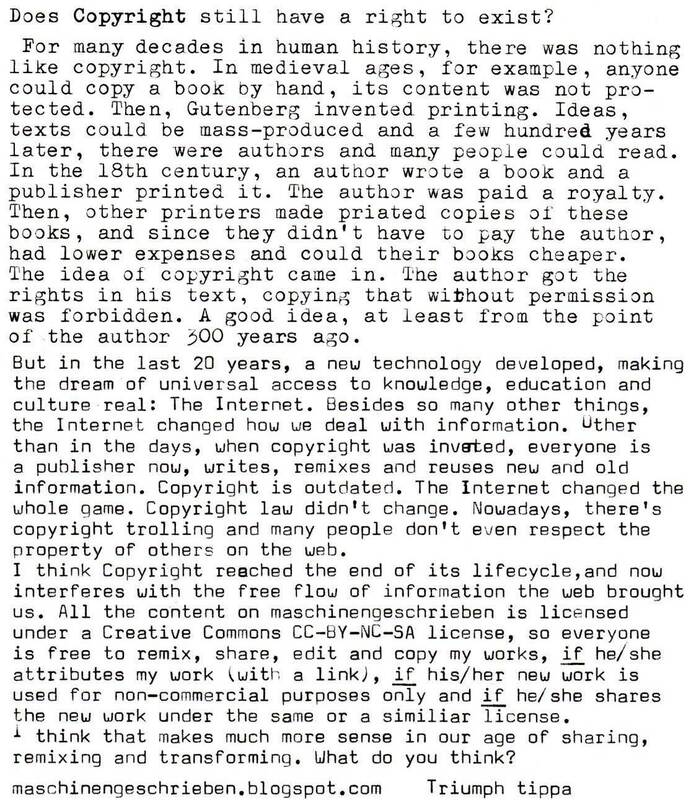 I have been mulling my own post on the subject of copyright. It will be longer than what can reasonably fit in your comments. But I will go ahead and share some of my philosophy. Your comments on Creative Comments licensing point to the concept of choice. There are times when I choose to have my creative photographic work freely available for non-commercial purposes. I've also donated full files for all uses with, and sometimes without, attribution. There are also times I choose to retain full copyright. For example, I have hiked to cliff ruins that have perhaps 50 visitors per year. That involved a 20 hour drive to get to the region, primitive camping in a wilderness area and 8 miles of hiking following topo maps and sparse cairns. That and carrying $2,000 worth of camera equipment and timing the hike to get to location in just the right light. There are also times I am getting to my car or camp an hour or two after sunset. I love the effort and craft involved in chasing light, but I don't always want to give away things that came from great effort. For me at least, copyright is selective and proportional. I'd love to hear the perspectives of writers. Does a blog entry feel different than a novella? 1. Copyright, like patents, encourages creativity by offering the creator exclusive rights to make money from the creation. Often, full-time creators can't afford to give away their creations for free. 3. In an age when anything visible or audible can so easily be digitized, copied, and published, © is obviously becoming nearly impossible to enforce. 4. 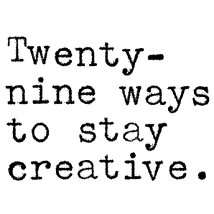 I like your Creative Commons policy, and think it's very appropriate for work that is intended to exist outside the moneymaking realm, in an atmosphere of sharing. Maybe I'll add something like that to my own blog! I have mixed feelings about this whole issue. I wrote a book and had it published, and I'm supposedly going to receive some fees from its sales sometime in the future (hopefuly while I'm still alive), and I can tell you that, the amount of effort involved in writing that book (reading references, doing research, writing, proofreading, drawing charts and illustrations, proofreading, creating tables and indexes, proofreading, writing footnotes, proofreading, creating the bibliography, and proofreading again) was so big and took so long to produce the final text, that it is really frustrating to see it taken and used without even mentioning who took the effort to produce that text in the first place. In cases like that, I am all for the copyright enforcement; the effort involved in creating that book was too much to give away. Blog entries, on the other hand, are created with other purposes in mind: they are meant to be shared, and the amount of effort involved in creating them is by no means comparable to the effort needed to write a chapter of a book. Perhaps if my entries were technical treatises or involved a lot of research, I wouldn't be posting them in a blog to begin with. So, I agree with the idea of creativity sharing involved in the CC licensing, but I also want the rights of authors who choose to copyright their works to be respected. It's both a matter of money, but also of ethics. It seems the stated purpose of copyright is to avoid Miguel's problem, yet it didn't work for him.